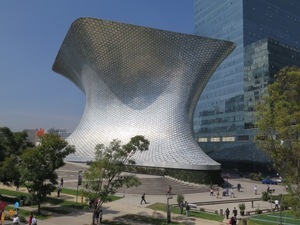 The surreal and shiny Museo Soumaya in DF. (Kind of how this Time Out win feels!) Photo: © tablehopper.com. Amigos! I was already on cloud nine from the week I just spent in Mexico City (more on that in a sec), and then today I am named the winner of the Time Out Win the Ultimate New York Life Contest! WHAT?! I know, time to go hit up the corner store for some Lotto tickets. YOU GUYS!!! I can’t thank you all enough, truly, because this wouldn’t have happened without all your votes, likes, posts, forwards, shares, tweets, and support. Dreams really do come true, and I am in awe of this win, it’s crazy! I have wanted to live in New York since I was 17 and was applying to college (but NYU was ultimately going to be too damn expensive). So New York has always been this nagging thing in my heart and head, and I feel like it’s one big fatalistic push that I get to go (and live there rent-free for six months, unbelievable!). So what does this all mean for tablehopper? Details are still being worked out with Time Out—I am so thrilled to be writing for them while I am in New York—but my intention is to send out an abridged version of tablehopper while I am there during the next six months. While I won’t be able to report firsthand on how SF restaurants look or taste, I’ll still be able to keep you posted on openings, news, events, and more. And, of course, I will be including some tidbits about what’s delicious in New York so you know where to eat the next time you visit! I’ll keep you posted on what’s next and my departure date, which is also still being discussed since we have the holidays coming (and I have some events I’m hosting in December!). For now, my new life hashtag is #anythingcanhappen. I’m living proof. Seriously, thanks gang, I am so fortunate to have the supportive and loving community I do. You make magic happen! One last note before we dive in: some of you may be scratching your head and wondering why you are receiving today’s newsletter! It’s because you signed up to win the Ultimate Wine Country Getaway contest a couple of weeks ago! Welcome aboard, I hope you enjoy the weekly tablehopper report on SF restaurant and bar news! Have a very Happy Thanksgiving. I know what I’m thankful for! YOU! Enjoy the holiday!